Ah, snipers. They get the fancy gear, the camouflage and the headlines. I do not have the patience to be a military sniper. These guys are sitting in the bushes or in a building for hours sometimes without moving a muscle. They have to have an extreme attention to detail, and I'd imagine they spend more time studying wind current than they do firing bullets. Sniping in an FPS is absolutely nothing like sniping in real life, and I hate when people think otherwise. I mean, you do have to find an isolated spot on the map, you can't give away your position or risk losing it and you constantly have to watch your back. Still, it's absolutely ridiculous to assume sniping in a game is anything like the real thing. 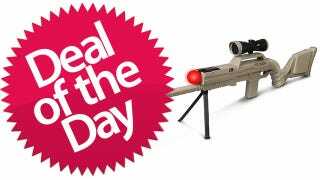 But this Playstation Move Sniping Rifle should certainly help convince you that it is!